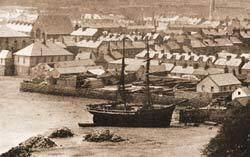 "William Jones timber yard 1890"
Pwllheli was truly an international port, as well as the main hub for the Llyn Peninsula. Below we take a glimpse at the movement of shipping between 1836 and 1869, when the town was at its busiest. Northumbrian, Capt Matthias, with timber from Poitou, New Brunswick. Hawk, Capt Jones with slates from Porthmadog. Henrietta, Capt Williams; Betsy, Capt Evans, with timber, from Barmouth. British Queen, Capt Morris, Peggy, Capt Prichard, with coal from Mostyn. Richard and Mary, Capt Jones, Eliza, Capt Jones, with sundries. Speedwell, Capt Griffiths, with limestones from Carnarvon. Spigot, Capt Roberts, from Abersoch. Stag from Aberdaron in ballast. Priscilla, Capt Evans. For Llanelli. Lively Capt Francis, Hawk, Capt Jones, for Porthmadog. Otter, Capt Roberts for Llanbedrog, in ballast. Stag, Capt Lewis, for Aberdaron. Spigot, Capt Robert Abersoch with timber. Fairy Queen, Capt Williams, for Barmouth, with sundries. Speedwell, Capt Griffiths for Dwyfor with limestones. Ann, Capt Evans, from Quebec, with timber. Ceres, Capt Ellis; Eliza Ann, Capt Roberts, with sundries from Liverpool. Defiance, Capt Jones, with sundries, for Barmouth. Rose, Capt Cloveley, for Bristol. Providence, Capt Davies, for Lymington. New Expedition, Capt Jones for Southampton, with slates. Mermaid, Capt Evans, for Aberdovey. British Queen, Capt Morris, for Porthmadog in ballast. Arrived on the 9th instant, the brig Aratus, Fowls, master, from Quebec, with a splendid cargo of fine Canadian timber, for Mr. David Evans, timber merchant, of this town. The weather in this locality has been most delightful, there having been all the week light, breezes from the eastward. The brig Martha, Captain Roe, after a thirty days' passage from Quebec, anchored in the Bay, off the Gimblet, on the 7th inst. Her cargo is of timber for David Evans, Esq., Mount Pleasant. Gimlet, Pwllheli Packet, Catherine, and Bardsey, for Liverpool. Baton, Mary and Jane, from Runcorn. Mary Elizabeth, Little Martin, Sisters, Orion, Andes, for Porthmadog. Ellen and Ann, for Aberdovey. Fossile, from Neath with Culm. Ann and Elizabeth, from Neath. Jane and Catherine, from Cork. Eliza Ann and Ellen, from Aberavon. Ann Prichard, Catherine and Providence, from Liverpool. Jane and Catherine and Daniel Morris, for Porthmadog. Quarry Maid, Eliza and Jane, Mary and Ann, Eliza Ann and Ellen, and Two Brothers, all for Porthmadog. Swallow; Mary Ann, from Porthmadog. 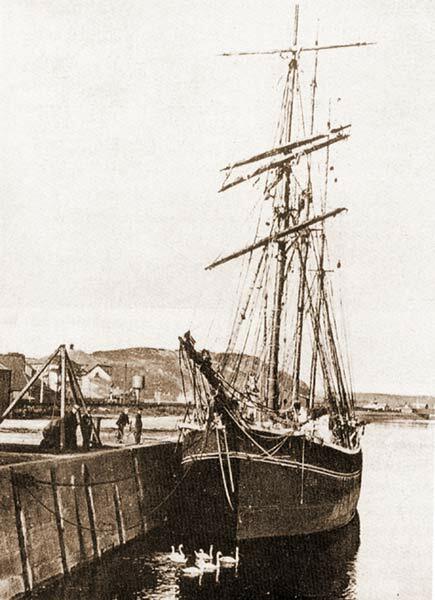 (August 15,1857) Pwllheli. The brig Thompson, Capt Burton, and the Cameron, Capt Hewitt, arrived from Quebec during the week, with prime cargoes of timber. Both vessels are consigned to David Evans, Esq, timber merchant, Pwllheli. It will be noticed that all four vessels arrived at Pwllheli in early August, a time of year, leaving Canada a month or so earlier, when fair weather could be reasonably expected. The brigs Ann and Northumbrian, as we have seen, were not so fortunate and many shipments of timber to Pwllheli involved winter passages. (December 14, 1861) Pwllheli. Arrival of Timber. On Saturday last, after a passage of thirty nine days, the barque Currency, of Whitehaven, Gibson, master, arrived at St Tudwal's Roads from Quebec, with a cargo of prime timber consigned to Mr. David Evans, timber merchant, of this town. Master and crew all well. 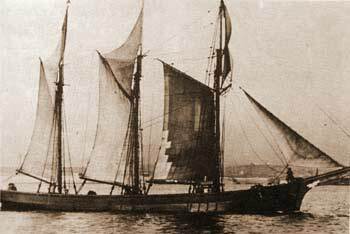 (July 24, 1869) Arrival of Timber. On Tuesday last, the brig Derwent, Capt Temple, arrived here from Quebec with a cargo of prime timber consigned to Mr. David Evans, merchant, of this town.